Although baby girl is not old enough for her kids lunch just yet, I have been thinking up tips on a healthy kids lunch for my nephew who will be heading into year 1 in September to pass over to my sister. He is a picky eater and loves cheese! With back to school is on the horizon Hartley’s set us on a challenge to come up with healthy tips and ideas for kid’s lunch boxes. 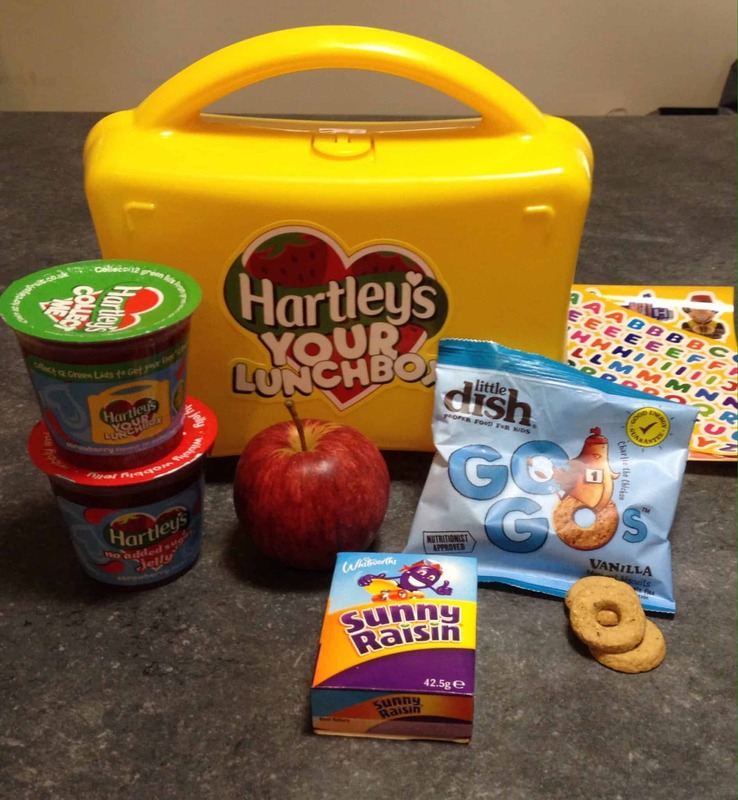 Hartley’s jelly pots are championing a campaign called Hartley’s Your Lunchbox. It’s all about helping parents create brilliant lunches and collecting an exclusive lunchbox through its collector scheme. You must collect 12 green foil lids from Hartley’s no added sugar jelly pots to exchange them for a lunchbox and 2 sheets of stickers at Hartleys Fruit . One sheet of stickers is full of letters for the kids to personalise their lunchbox and the other is full of characters. Fruit- eg. apples, bananas, and oranges. Why not make up a little fruit salad pot? You can add fruits like melon, pineapple, kiwi fruit and strawberries. Dried fruit – raisins, dried apricots and prunes. Hartley’s no added sugar jelly pots. Healthy kids biscuit snacks eg Little Dishes Go Go’s. Vegetable sticks – cucumber and carrot. Sandwiches and wraps with fillings like tuna mayo, ham and cheese and cheese and coleslaw. Hard boiled eggs for protein. Cubes of cheese, fromage frais or fruit yogurt for calcium for those growing bones. Snacks – bread sticks, rice cakes, cupcakes. So these are my tips for a quick, easy, healthy and nutritious kids lunch. What are your ideas for your kids lunches? What do you do differently for Summer and Winter? Some great inspiration there and I wish my childhood lunches had included pasta. Commenting for myself and on behalf of BritMums and thanking you for taking part.